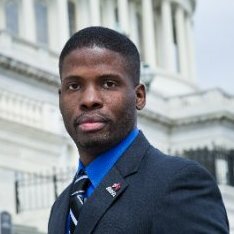 Brooklyn native Tireak C. Tulloch enlisted in the Marine Corps Reserve in June 2000 as a tactical data network systems specialist. He was deployed to Iraq in 2003 with Alpha Company, 6th Communication Battalion, supporting ANGLICO Marines and Navy SEALS with classified network access along various points alongside our British counterparts. Tireak deployed again in June 2004 to Camp Blue Diamond, Iraq, where he provided technical liaison support to an Army signals unit and handled network security for 1st Marine Division. After completing his second tour in 2005, Tireak started to look for work in his field of expertise. In 2006, Tireak took an entry-level technical position with MTA Long Island Bus. He separated from the Marine Corps in 2008 and in 2009 started a new position with MTA Long Island Rail Road as a Junior Network Engineer. In 2010, he attended a retreat for combat veterans hosted by the Coming Home Project as has been advocating for veterans ever since. He is also a spokesman for Iraq and Afghanistan Veterans of America (IAVA) and currently resides in Huntington, New York.